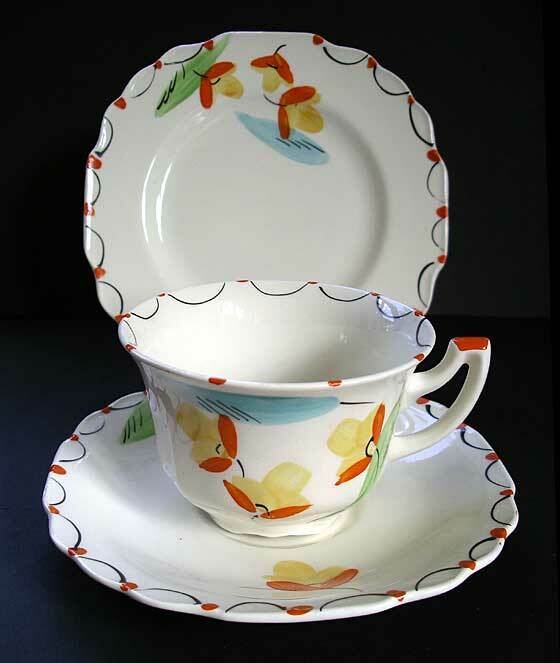 "A cool art deco design Myott trio with hand painted deco floral pattern decoration in classic art deco colouring of crocus yellow, red and black. The scalloped edge decoration to the pottery is a subtle but very effective design feature. 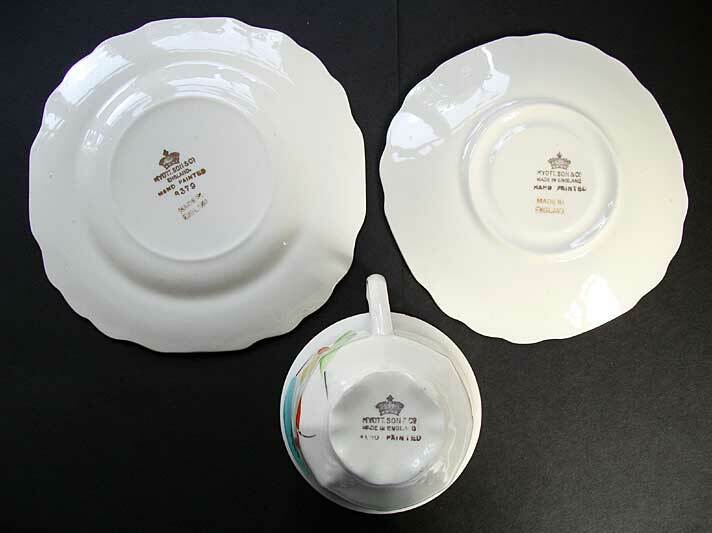 This tea or coffee cup, saucer and tea plate look very minimal and contemporary. 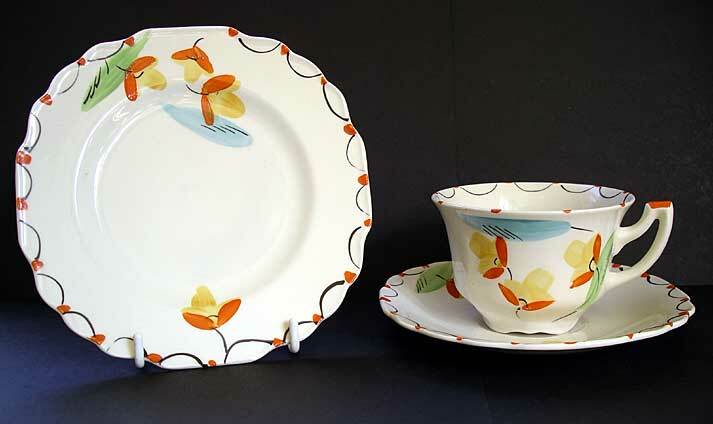 Myott were masters at producing stylish Staffordshire ceramics of the 1930s art deco period alongside contemporaries Clarice Cliff. 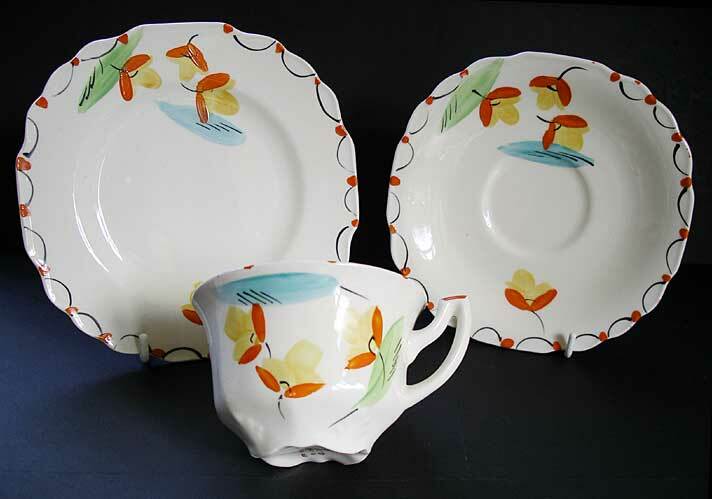 A great set for the discerning collector of art deco style and looks simply great on display!" Antiques Expert Hamilton Bear. Dimensions: height cup 65 mm max. width saucer 152 mm max. width tea plate 163 mm max. Marks: as illustrated below to all pieces. Condition: A super attractive item and excellent for display. Condition report: no restoration or damages to pottery caused by careless handling. Tiny firing marks: flat bare and rough areas to glaze to underside of pieces. This was caused by kiln furniture removal and is fairly common on pottery of this type. Minute traces/specs of wear to painted decoration. Several minor clear knife-wear marks to surface glaze of plate through use - only visible on close inspection in angled light. Overall an excellent set.